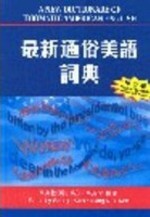 CHINA BOOKS :: A New Dictionary Of Idiomatic American English (Revised Edition) KAO George & KAO Irving K. Y. A collection of over 2,000 American English entries. Apart from single words, compound expressions, phrases and whole sentences are also discussed. The entries are selected from everyday and common usage, and whenever possible, their Chinese counterparts are cited. This is a very useful reference for not only students, but all those learning and speaking English. This revised edition brings its contents up-to-date. George Kao is a well-known writer and a experienced translator. He is the founding editor of the journal, Renditions, published by the Research Centre for Translation, CUHK. He is now retired in USA. Irving Kao was the Director of Public Information at Alfred University and a librarian at the University of Michigan, USA, before his retirement in 1998.